Definition and Summary: The Ten Percent Plan was conceived by President Abraham Lincoln during the Civil War in order to reunify the North and South after the war’s end. On December 8, 1863 he issued a Proclamation of Amnesty and Reconstruction offering pardon to Confederates who would swear to support the Constitution and the Union. The lenient Ten percent Plan first required 10% of seceded state voters take oath of loyalty to Union. Second to create a new state government and third to adopt a new constitution abolishing slavery. Abraham Lincoln was the 16th American President who served in office from March 4, 1861 to April 15, 1865. The Ten Percent Plan was President Lincoln's plan for reunification of the United States. 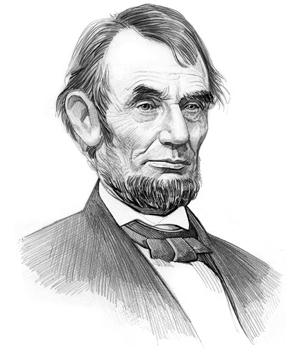 The idea of the Ten Percent Plan was conceived by President Lincoln during the Civil War to present his strategy to start the difficult task of Restoration. It was President Lincoln's effort to try to reduce the anger and bitterness caused by the horrific Civil War. He took the opportunity to seize the initiative from volatile members of Congress on plans for Restoration, by issuing the Proclamation of Amnesty and Reconstruction on December 8, 1863, a vital component before the Ten Percent Plan could be fully adopted. ● New state governments to adopt a new constitution abolishing slavery. Ten Percent Plan for kids: What was Lincoln's Ten percent plan designed to do? Once a Southern state, equal in number to one tenth of that state's total vote in the presidential election of 1860, took the prescribed oath to the Constitution and the United States, and organized a government that abolished slavery, President Lincoln would grant that state government executive recognition. Ten Percent Plan for kids: How did Congress respond to Lincoln's Ten percent plan? The admission to Congress of Senators and Representatives from 'reconstructed' states would rest with Congress and several states were reconstructed on the Ten percent plan. There was strong opposition from many members in Congress, who believed a Reconstruction plan should restore to power the old plantation aristocracy. Then, in July 1864 the radical Republicans in Congress, fearful that slavery would continue due to the leniency of the Ten percent Bill, pushed through the Wade-Davis Bill. The inflexible Wade-Davis Bill, sponsored by senators Benjamin F. Wade and Henry W. Davis, outlined far more stringent requirements for re-admission to the United States. President Lincoln applied the Presidential pocket veto of the Wade-Davis bill and continued with his Ten percent Plan. By the end of the Civil War the Ten percent Plan had been tried, albeit not too successfully, in Virginia, Louisiana, Arkansas and Tennessee. Congress, however, refused to seat the Senators and Representatives elected from these 'Ten percent' states. Many people in the North were opposed to the Ten percent plan and President Lincoln and Congress had reached a stalemate. Then the unthinkable happened. President Lincoln was assassinated by James Wilkes Booth. Vice President Andrew Johnson assumed the presidency. President Andrew Johnson lacked the experience, charisma and patience of Lincoln and immediately became involved in the struggle with Congress regarding the process of Reconstruction. The people had trusted Abraham Lincoln and, had he lived, he might have induced the people to accept his Ten percent plan. The article on the Ten Percent Plan provides an overview of this Important presidential strategy. The following Abraham Lincoln video will give you additional important facts and dates about the political events experienced by the 16th American President whose presidency spanned from March 4, 1861 to April 15, 1865.